MGB Food News: Breakfast is getting better.. I have been experimenting with eggs and have a really nice pan to cook them in that my cousin Nicole gave me.. What a thoughtful and very useful gift as it cooks just one egg which is enough for me.. The photo to the right shows my attempt at egg with asparagus which was tasty and went down nicely. 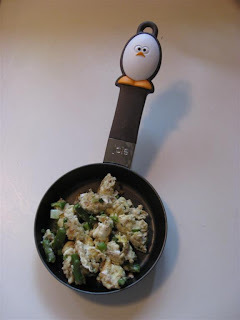 Notice the handle of the pan has a smiling egg.. pretty cool and non-stick too. Nicole has made the one egg omlette fun with this cool new pan. Thanks Nicole! Hey Mike! I'm glad you like your frying pan! I have a matching one at home!! !